After getting over what might come across as shock over the many titles (books) published by African writer Omoseye Bolaji over the years, one would definitely be struck with how fascinating and intriguing many of the titles of his works are. Perhaps you skip over such titles like The Termagant (his first published work of fiction), The ghostly adversary (one of his major novels), The subtle transgressor (his only play), Snippets, and Reverie (both works of poetry) - but this might still not prepare you for what to come. Especially the Tebogo Mystery series, the last four in the series, probably. Tebogo and the haka (can the title be appreciated in west Africa? 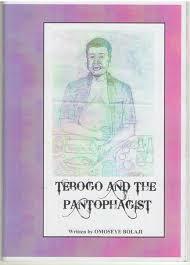 ), Tebogo and the epithalamion, Tebogo and the pantophagist (what! 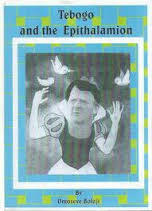 ), Tebogo and the bacchae...yet once we actually read these books, we easily appreciate the creative titles. Oh, the joys of reading reviewers and critics! Pule Lechesa, a celebrated SA critic and writer, has published many books on Bolaji. In Bolaji in his pomp (2013) he brilliantly suggests that Peter Cheyney, a British writer who was at his peak many decades ago, has been a major influence on Bolaji as a writer. Speaking to Bolaji in one of his bases in Nigeria, I personally asked him about this, and was stunned when he said: "Lechesa is right, though he himself might not have imagined how much I liked Cheyney in my youth...indeed THREE of the titles of my own books were directly taken from Cheyney's works..." I checked, and found out that this is true. Bolaji's books - They never say when (1994), It couldn't matter less (2013) and the forthcoming Sorry you've been troubled (2017) are all old titles of Cheyney's books. Bolaji's books bearing these titles have nothing at all in common with Cheyney's works, it must be pointed out. This would suggest strongly that the columnist is implying that after centuries of undermining women (“dames”) by the world – until just over a hundred years ago, eg even in western countries women had very limited rights – women nowadays seem to be getting some sort of retribution (revenge) on men, with the latter bearing a lot of the burden these days. By the same token, alternatively there is also the implication that women might also pay ultimately for whatever heartaches they are meting out to partners. We can be attracted, enthralled by many of the titles of books written by African writers - perhaps Arrow of God (Achebe), Why are we so blest? (Armah), Devil on the Cross (Ngugi), Abyssinian Chronicles (Moses Isegawa), Wedlock of the Gods (Zulu Sofola), Book of Not (Dangarembga) etc - but there can be no doubt whatsoever that Bolaji has turned out much more than what should be his own fair share of such intriguing titles in African literature. We should also note that in 2018 Bolaji published the latest Tebogo adventure, titled Tebogo and Uriah Heep.